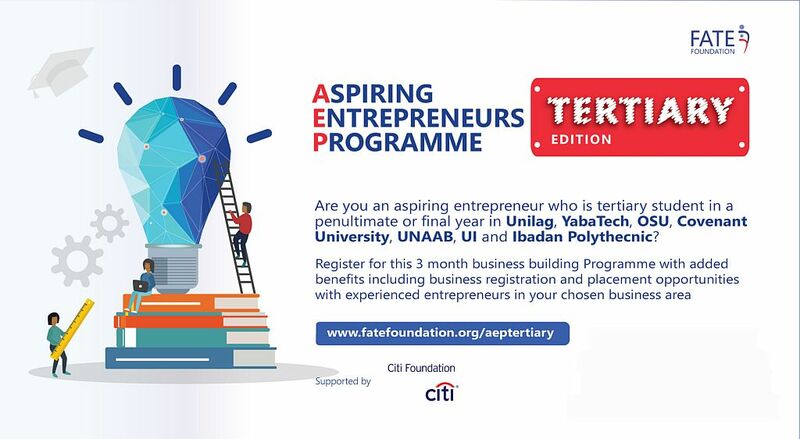 FATE Foundation in partnership with Citi Foundation is pleased to announce the call for applications for young aspiring entrepreneurs from ages 18 – 35 in tertiary institutions within Lagos, Ogun and Oyo states. To qualify, entrepreneurs must be in their final year or penultimate year who have viable business ideas or have already launched their ideas and are computer literate. Mentoring support through a 12-month mentoring programme which happens post the enterprise training phase where each aspiring youth entrepreneur is matched with a mentor based on identified mentoring goals through group and one-on-one mentoring structures. Advisory and business support to enable the development of a business plan and also address critical startup support areas where youth entrepreneurs usually require support and handholding on challenge areas such as business registration with the Corporate Affairs Commission (CAC), business plan development, financial, tax and advisory support and digital marketing. Placement for youth entrepreneurs with already existing entrepreneurs/ businesses in their field for a 2-4-week period so that they get the first-hand experience of running a structured business. Each programme stream will run two (2) times a week (Fridays and Saturdays) over an eight (8) week period and will involve very interactive and hands-on practical workshop learning sessions. Applicants must be a tertiary student from any tertiary institution where the program will hold (Lagos, Ogun and Oyo). How many entrepreneurs are you selecting? We will be selecting 40 entrepreneurs per session for each of the 3 cities. How do I know which location to apply? We strongly advise that you should apply to locations where you are a student or resident. There is no Fee. The programme is free for all selected participants as the fees have been paid and fully conered by the CITI Foundation Grant. However, participants will be expected to get themselves to and from the location of the training venue. Only applicants shortlisted to the first stage will be contacted. Can I make changes in my application after I have submitted it or can I do a fresh application instead? No, once you have submitted it is final and you will not be able to edit the application. Also, multiple entries will be disqualified. So, we encourage you to verify your application carefully before submitting. What is the time involvement expected for participants? Each stream will run on Fridays and Saturdays every week for eight (8) weeks for about 4 – 6 hours each day. Where should I send any enquiries?